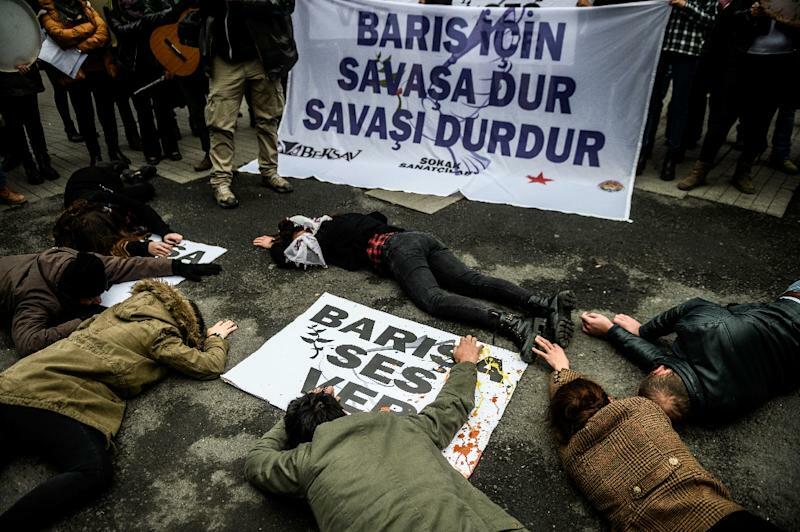 Diyarbakir (Turkey) (AFP) - Turkish security forces killed 32 Kurdistan Workers' Party (PKK) militants over the weekend in fighting between the authorities and rebels in the country's east and southeast regions, the army and media reports said. The security sources raided a home in eastern Van province after receiving intelligence that the PKK militants were planning a large-scale attack on government buildings, killing 12 rebels, Dogan news agency reported. One policeman was killed and two others were injured in the ensuing clashes, Dogan added. "The terrorists came to Van to stage a big attack. Fortunately, we managed to prevent it," provincial governor Ibrahim Tasyapan told reporters, adding that dozens of hand granades and rifles had been seized in the raid. The army said that a further 20 militants had been killed Saturday in southeastern towns of Cizre and Silopi in Sirnak province near the Iraqi border as well as the Sur district of Diyarbakir -- all subject to a blanket curfew. A soldier and a police officer were also shot dead in Diyarbakir -- the largest city in the Kurdish-dominated southeast, security forces said. The army says that that a total of 448 PKK members have been killed in the three towns since the current campaign started in mid-December. Turkey wages an all-out offensive against the PKK, with military operations backed by curfews ongoing to flush out the rebels from several southeastern urban centres that have raised concerns of a humanitarian crisis. The operations mark a new escalation in five months of fighting with the PKK, which initially fought for Kurdish independence but now presses more for greater autonomy and rights for the country's largest ethnic minority. According to Haberturk daily's website, Prime Minister Ahmet Davutoglu told a closed-door meeting of his ruling Justice and Development Party (AKP) that the operations and curfews in the southeast would end within a week, but "there was no deadline." "We will pursue our fight against terrorism with great determination until these killers have been wiped out from our mountains, plains and towns," he told the meeting on Sunday in televised comments. In Istanbul, a group of street artists, actors and musicians marched on Istiklal Avenue to call for an end to violence, carrying placards reading "Make noise for Peace!," an AFP photographer said. Human Rights Foundation of Turkey said on Saturday that over 160 civilians, including 32 civilians, had so far been killed in curfew-hit towns.